How do you define Art? Do you prefer the traditional artists such as Da Vinci or Rembrandt? Or do you prefer abstract paintings? Recently opened in London England is an exhibition of Art by Animals such as Elephants, Gorillas and chimps. The Grant Museum of Zoology which is based at the University College, have found numerous paintings from various zoos around the world, and have brought them all together to show that its not just people who have an artistic talent. Recent studies have shown that animals are actually much more intelligent than previously thought. We have always known that Elephants have a great capacity for memorising places and people. And throughout history dolphins have been the heroes of the sea, often coming to peoples rescue. And of course our greatest friend the dog, has shown amazing intelligence and loyalty in the most dire of circumstances. But painting? Boon Mee is an Elephant from Thailand. He was first used for logging in the local area, and was trained to paint by keepers. He paints by responding to small touches to his ears. It seems that he took to it like, well a duck to water, or in this case an Elephant to canvas! However, some of his paintings are remarkably well done. So is he the artist, and how much is done by his helper? For example, by moving the ears, are they leading him across the canvas, or has he learned to do it by himself with just a little help? Monkeys go Ape over Paint! Evidently even in the animal kingdom there is a difference between techniques. Elephants paint pictures that can be recognised straight away, but monkeys seem to go for the abstract approach. Its been said that there isn’t a lot of difference between monkey’s painting abstract, and humans doing exactly the same thing! Doesn’t say much about the human artist. Unless of course you like that type of artwork. 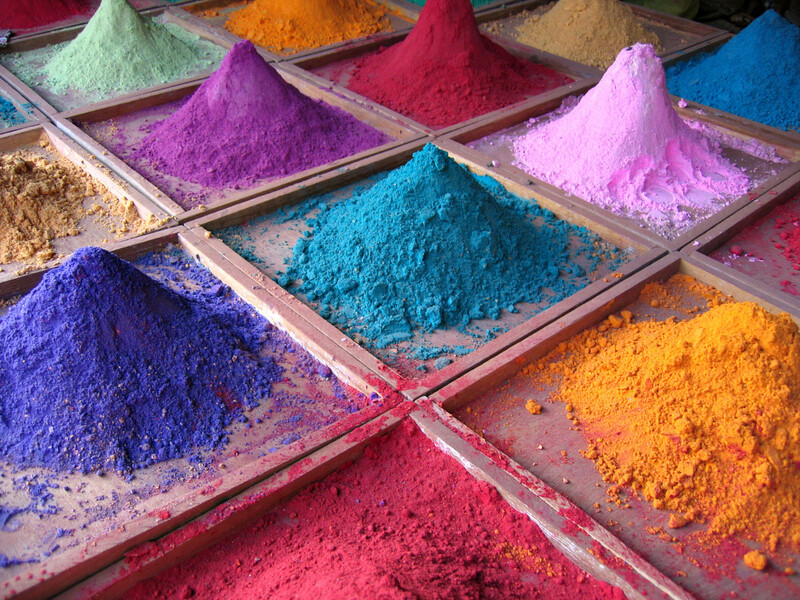 There are many artists out there today that make their living from splashing paint onto a canvas, wall or even pavement. Personally I prefer the good old fashioned paintings, but there is room for a splash of color on your wall. The rather bizarre fact is that monkeys use the same techniques as humans. Saying that, I would have thought monkeys, being our nearest primate relative would have been able to wack out a couple of Picassos or maybe a Rembrandt! But there you are. The one thing that surprised me is that there are records of monkeys painting ever since the 17th century! It wasn’t until the 1950s though that we started to take the whole thing a lot more seriously. Back in the day there was a TV program aptly named Zoo Time, that showed primates getting all artistic and would you believe, there was one called Congo who even went on to have his own art exhibition! Not all animal artists are the ones you would expect, so here’s a few I have discovered that will make you smile. How many dogs do you know that will get handy with a paint brush? Maybe you can get your dog to do a bit of painting. If he isn’t that inclined to put brush to canvas, then maybe he can get on with painting the bedroom wall! Here’s another thought. Does he have a kennel? There you go! Cholla the painting horse is a real celebrity. A cross between a Mustang and a Quarter mare. His art is well known, selling in 28 States, 3 Continents, and loads of Countries. Evidently he has caught the eye of scientists who think he’s a marvel. Well I tend to agree with that! Born in Nevada in 1985, he started to paint in 2004. Evidently he watched his owner, Renee paint the fence and would follow her, watching her every move! Out of curiosity, Renee tacked some paper to the fence and handed or should I say mouthed him a brush! And his career was born. In 2005, The Art Newspaper ranked him as the 4th highest selling animal artist in the World! And last but not least the Bronx Zoo sea lion artist! This ones just for fun, I think! 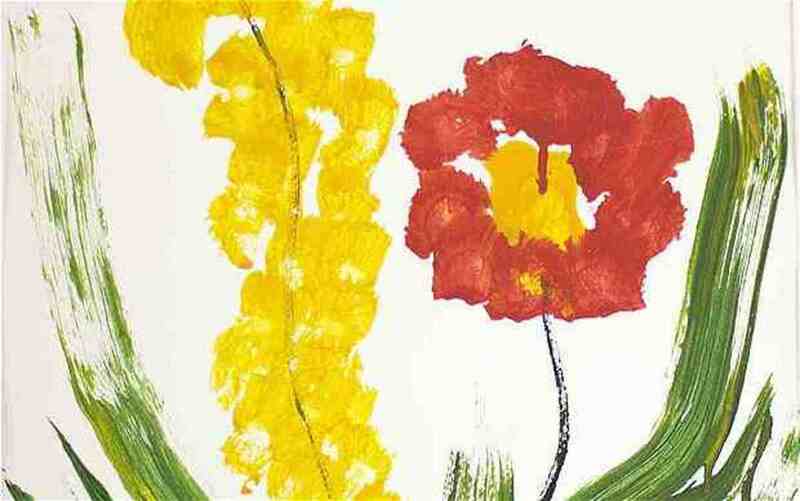 But you never know, maybe one of these days his paintings will be hanging in the Tate Gallery. Considering that some of the art painted today is just a mess of squiggles and lines on the canvas, or squares painted in black on a red background, surely this talented sea lion can get his artwork into a few galleries! Mind you, can you imagine having to interview him? At least animals have got an excuse for painting circles! So you see, there’s plenty more fish in the sea, or should I say sea lions out there that give Picasso a run for his money! Here you can see him getting his teeth into it! Do sea lions have teeth?! Do You Believe Its A Good Idea To Teach Animals To Paint? Yes its a great idea, its stops them getting bored. No its cruel, and shouldn't be allowed. Its animal exploitation, so I don't care if the animals enjoy it. Its a great idea as long as the money from the sale benefits the animal. Spiders. Scary or just misunderstood? Spiders are they scary or is it just the way we see them? Fascinating facts about our tiny Arachnids. Red Kites are native to Great Britain but it wasn't that long ago this beautiful bird of prey nearly became extinct. Thanks to conservation in Wales and breeding in England, we can now see these majestic birds soaring through our skies. Tigglywinkles is a hospital for sick animals, and one of them is an amazing little hedgehog called Snowball who is genetically different. He is a very rare albino. Who would have thought that elephants have such artistic talent? Fascinating, and thanks for researching such an interesting hub. Hi Integrity, nice to see you, and thanks! That is another interesting one. I voted up for sure. It's wonderful what animals can do, Nell! I once saw Thai elephants recording a CD...they played the gongs. I'd share the track if I still have it!! This is so beautiful, and I'm sharing. I'm actually deeply saddened by the Boon Mee clip especially. I love elephants and have done a lot of reading on them, especially the elephants of Thailand. Much like street begging and elephant rides/trekking, these elephants were put through a highly cruel and unnatural process of training and -Phajaan- or 'breaking the spirit'. Where the babies are forcefully removed from their mothers and tortured till they eventually become so traumatized they are an empty shell/do whatever the trainer asks of. 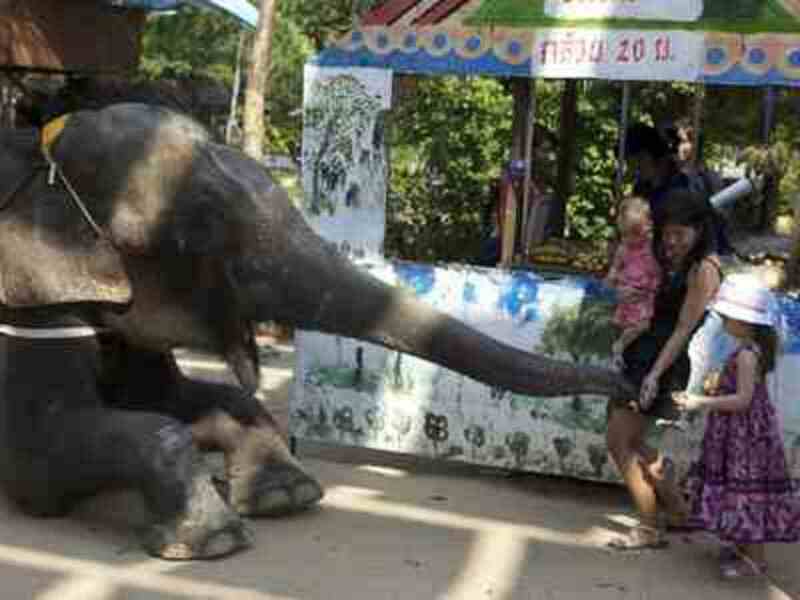 Elephants are very gentle but this is an ugly side of tourism people don't see. And I'm very upset whenever I see people unaware of this and indirectly promoting elephant tourism (or even animal circuses). Sorry for the long rant, but this hits close to home. You can read more about it here: http://journals.worldnomads.com/responsible-travel... or google 'Sangduen "Lek" Chailert', a lady who's devoted her life protecting them. I LOVE THIS. Voted up and shared. Nell, these animals are smart indeed! I saw animals in Thailand who actually played the gongs. They even cut a CD!! They can emote, like what Tammyswallow said, better than humans can at times!! Thanks for a lovely hub! Now this is simply adorable, Nell! I couldn't help but crack up seeing that dog pain and his tail wagging back and forth like crazy! 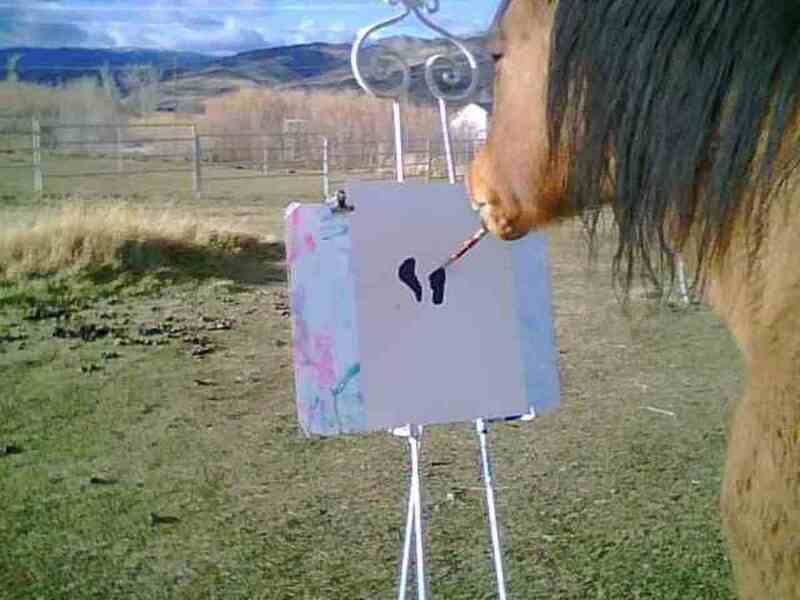 Goes to show that other animals can enjoy painting :) It definitely keeps them entertained! Well done and very informative, Nell! Voted up and sharing! All and all this has been a rather crappy day...until I saw this hub and watched these awesome artistic animals! Now THIS is art therapy! Hi jellygator, yes that would be great, you may have something there! lol! Hi CCahill, lol! glad you liked it, and thanks! Nell...so very interesting...and fantastic. I saw so much in Chollo's paintings; an angel, birds, a woman's partial face, a dolphin, so many images. I'd venture to submit that this art is the most "pure," it is without ego, intent, predetermination....but, rather, is pure "in the moment" expression. The movements of these artists are definitely meant to put brush on "canvas." I'd say this IS intentional . (It does appear that Moon Bee, for sure, & the other artists ARE attempting to duplicate that which they see..and doing a great job of it. I don't know..but I still contend that the art is pure). These videos and stills are truly astonishing. Thank you for this illuminating hub, Nell...it is pure magic!!!!! Up Awesome Beautiful !! Intriguing! It would be very cool if animals and humans learned to communicate better through artwork somehow, but only a couple seemed to really have an idea that they were creating something. This is amazing. Voted up and sharing. I know I saw one or two of these cases on TV, but I had no idea animal art was so widespread! This article is so well researched! Animals are a lot more intelligent than we give them credit for. Thank you for sharing! I want to meet Boon Mee too and the rest of the gang. They are very talented. Thanks for sharing this hub. I am such an animal lover so I really enjoyed learning about animals that paint. Animals are so intelligent. Who knows what they could learn if we just took the time to teach them? You always come up with such interesting information! Animals paint! Wow! If they are able to do various amazing tactics on their own, why not paint by themselves? Actually, most animals are talented and intelligent. I would like to visit the Exhibition of Arts by Animals in London in the future. Thank u for sharing. Awesome and Interesting. Vote up. I had absolutely no idea that these animals could be so talented with a paintbrush...wow! But I guess the first question that pops into my mind is "what person thought...hey...let me give this monkey a paintbrush and see how well he can paint a still-life?" LOL. Loved this hub...super intriguing. Voted up and awesome. Hi, poet, its funny you should say that! I watched on tv today, and yesterday, a program called Super Smart Animals, I think the monkey was on there that you are talking about! there were two, one who could do very fast number recognition, in fact he was faster than a human! but tonight this other one actually used a chart with symbols on it, and so did his teacher, he touched each picture to say what he wanted! he told the presenter that he wanted to put his collar on, get in the car and go out! so they did, he then pointed to where he wanted to sit down by the river, and proceeded to lay on the picnic cloth, preen in front of a mirror, and point to the list and demanded water and food! it was hilarious! but sad too, at least this program showed us that animals are so intelligent, luckily he loved what he was doing, oh and he wanted a shower, so they had to get the hosepipe out so that he could have a drink and shower! amazing! I had no idea! This is so cool. I think it shows without a doubt animals are much smarter than some give them credit for. I heard, years ago, about a primate in captivity at some University that was taught sign language and even some words via print. The primate in question was left out one night. The next morning a question from it was found on the computer screen. It was something to the effect of... all the other people get to go outside...(it could see the students walking through the window)... why can't I? It breaks my heart every time I think about it. Nell, this was fabulous! Thanks Will, hope so! I wonder if my brothers cat will appreciate it if I buy him a set of paints? lol! I agree that they are probably having fun! Animals can be trained to do lots of things. I understand that Boon Mee, the elephant, is controlled by the trainer with touches to its ear. Are animals capable of producing abstract art? Maybe. And maybe they are just doing what they're trained to do. Very enjoyable article Nell with great videos. I just wish someone could show me how to train a cat to do the washing up and the vavuuming. That's what I need. Hi, Alastar, Oh that's great! I am glad she liked it, thanks for sharing it with her, I love anything to do with animals, I always watch the animal tv programs and get really annoyed when they are exploited for any reason, in this case I think they like it! lol! Terrific gathering of information about animal artists for a hub! I had seen some of this previously but never so much of it gathered together in one spot. This should be a winner! Voted up, interesting and beautiful. Enjoyed this! Hi, Movie Master, I will have to see that too! I really want to know how they all got started, thanks! Thanks steph, It just fascinated me, I remember reading about the Elephants before, but not the horse! lol! Hi Nell, a terrific hub, these animals and their paintings are amazing, I have just seen a trailer for a documentary on TV for next week on this and can't wait to see it! This is a very interesting hub with intriguing videos, Nell. I think that getting animals to paint is fine if it's adding interest to their lives and they're not being forced to do anything that they don't want to do. My favorite painting is Boon Mee's, because I'm not really interested in abstract art and I do like nature art! I'm a bit worried about how the elephant was trained and is being guided, though, because the painting seems so good to me, considering it was created by an elephant. I hope that Boon Mee enjoys what he does and is treated well. Wow if I had only known this when I had my zoo! Now I have to go back and watch them all again! Great fun! Hi, lily, thanks! say hallo to your dog, and don't forget to get him a canvas and brush! haha! Hi Nell! I LOVED this Hub! I think Cholla the horse has real talent. I was absolutely blown away by the pictures the horse created. The dog and the sea lion were cute, but obviously responding to trainer's or owner's gestures. I think the sea lion had more fun throwing the brush back than actually painting! I would buy one of Cholla's paintings in a heartbeat. I have always felt that animals are so much more than stupid beasts as they have always been portrayed. Voted Up and Awesome. Another winner! Thanks so much pras, yes they are funny! lol! I love the capucine monkey painting away on the wall, as though he knew exactly what to do! have a great weekend, and thanks! Wow...wow...wow..wow. May I said "wow" again. This was awesome hub and very inspiring. I love art and I love animal as well. Nell, you have done a great job by writing this hub and share with us. I know that animal have good intelligence, especially for monkey, dolphin, elephant and so on. Wow, I can't imagine that they can paint as beautiful as these. I really enjoy all pictures and the videos as well. Rated up! (useful, funny, awesome, beautiful and interesting). You know why I "push" funny button? because those animal look "cute" with their talent. Have a nice weekend! Hi, Jamie, thanks for reading, Cholla really is a wonder horse! lol! I couldn't believe it when I found him, I bet there's loads more animals out there getting out the easel! haha! maybe I should get my brothers cat to do some, thanks! Hi, Cardisa, yes I have seen a couple of the programs but not the horse, love that one! thanks! Hi, christopher, haha! might have known you would say something like that! thanks for the giggle! Hi, iguidenetwork, yes fascinating isn't it? of course they probably don't realise what they are doing, apart from maybe the elephants! but still it is cute, especially the flower pot painted by boon mee! thanks! Hi, tammy thanks, there is a program on tv soon about how intelligent animals really are, I am looking forward to seeing it, I love the Elephants! lol! Intriguing Nell. Can't say I'm too impressed by the sealion or the dog which seem to be just moving their heads around without particularly knowing what they're doing with the brushes. The horse appears to consciously pick up the brush and paint, but there is a noticeable jump in the film between the 2 actions. Did it really pick up the brush intending to use it on the canvas, I wonder? Chimps and maybe monkeys I'm sure have an awareness of what they are doing, and produce work which has been mistaken for the work of human artists. 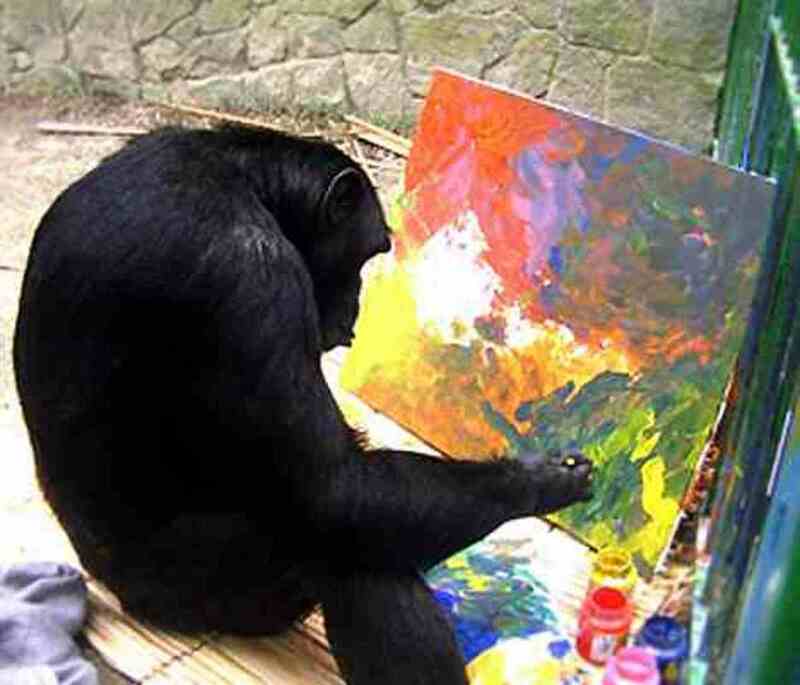 Which (in my opinion) just goes to show how over-rated abstract art really is - original maybe, interesting maybe, but not really indicative of real talent either in chimps or humans. Most intriguing is the elephant. 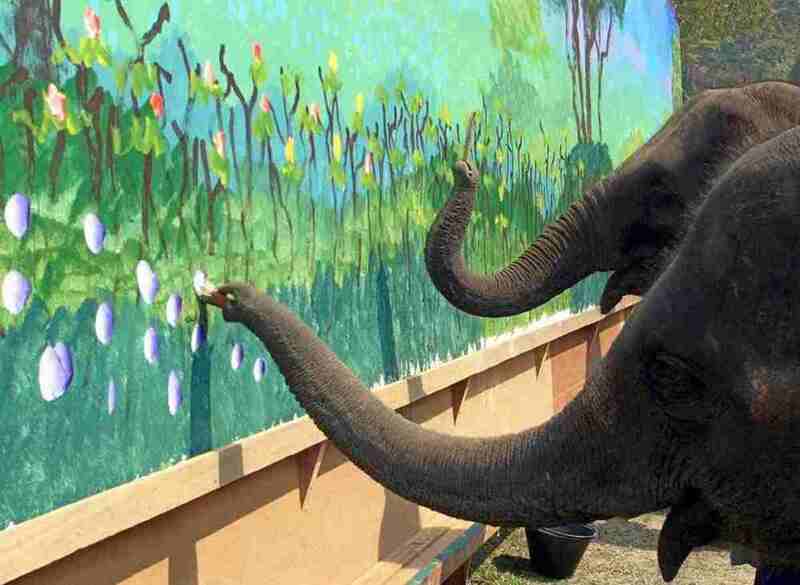 That looks like a genuine painting of flowers, but I wonder how much the handler is manipulating and directing his trunk? Besides, as I understand it, elephants cannot see in colour. For all that it is an attractive and interesting subject and a good hub Nell. And I'd just love to believe that animals besides chimps really can consciously create art. Voted up. wow, really? lol.. i get the monkeys artwork, but the elephants? That's stretching it - and i nose it! LOL..interesting topic and food for thought, but, i'd rather monkeys and elephants just got to do what monkeys and elephants do..whatever that is. It probably isn't painting.. This is too cool. I believe it's possible for animals to communicate with humans in many ways. It's amazing that humans took this long to give "unlikely" animals (such as an elephant or a horse) a paint brush - or perhaps it has taken this long for people to get the story. Anyway, it's fantastic and confirms the intelligence and creativity of animals in a magical way. How interesting! I am in awe. And I've fallen in love with that adorable elephant. Nell, thanks for this much interesting and awesome hub about art by animals. Hey Nell, I have seen these amazing animals on documentaries. They are truly awesome. Fascinating hub. I understand that some elephants who paint on canvass are very territorial about their art; meaning that they don't want other elephants to intrude on their creative turfs. Up and interesting! Now, if I could only get the cat to do the washing up, my life would be sorted. I was so intrigued by this, just the knowledge that animals are thought of as unintelligent and even stupid bothers me. I really do belief they know a lot more than we give them credit for. If it's difficult for humans to comprehend the intelligence of art, but animals can accomplish this. Well we have to give them more than credit, and stop trying to domesticate them, and more importantly stop killing them for food. So many people say animals don't have souls. I think animals think and have deeper emotions deeper than we could ever imagine. I never saw such a thing. This is adorable!